On Tuesday night the Grand Ducal Family in the persons of Grand Duke Henri, Grand Duchess Maria Teresa, Hereditary Grand Duke Guillaume, Hereditary Grand Duchess Stéphanie, Prince Félix and Prince Louis hosted a dinner for the members of the Chambre de Députés. 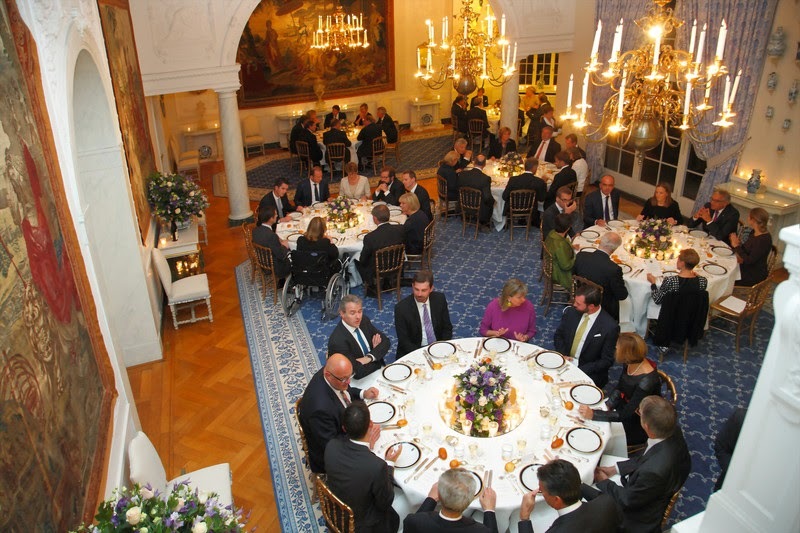 Formal dinners for the members of parliament at Château de Berg are a regular occurence in Luxembourg. They take place to give the members of the Grand Ducal Family and their country's highest politicians a chance to catch up and for an exchange of views. It's interesting to note that the Grand Duchess is sitting in a wheel chair for the dinner. It seems that the recovery time after her knee surgery will take another few weeks. She already seemed better a few weeks ago when she was pictured with crutches. The website of the cour has more visuals of the night.